The Vilar Performing Arts Center has announced the lineup of their fall 2018 Underground Sound series, featuring seven diverse performances from across the musical spectrum. Also known as the Love for the Locals series, Underground Sound hopes to help patrons of the VPAC discover new sounds. Clap Your Hands And Say Yeah Saturday, Sept. 22, at 7:30 p.m. The musical project of American indie rock musician Alec Ounsworth, Clap Your Hands And Say Yeah was founded in 2004 and is based in Philadelphia and Brooklyn. Shortly after the release of their first album, they received attention and favorable reviews from publications such as Pitchfork Media who gave the band a “Best New Music” commendation. Thursday, Sept. 27, at 7:30 p.m. Internationally acclaimed guitar virtuoso Trace Bundy has been described by fans as the “Acoustic Ninja.” Bundy uses harmonics, looping, multiple capos and his stage presence to deliver a unique live concert experience. Tuesday, Oct. 9, at 7:30 p.m.
Clinard dance is pioneering a unique style of flamenco dance by abandoning the representational ties to the form and relying on the rhythms and a sense of improvisation. 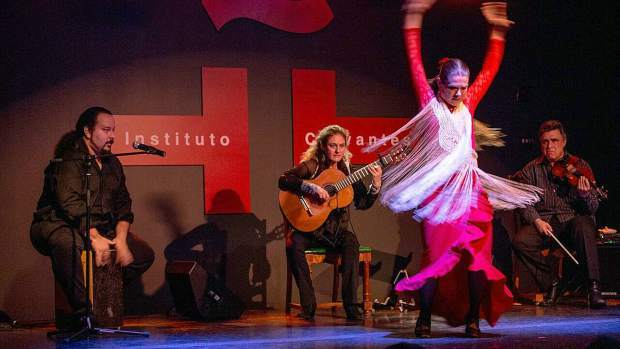 The ensemble seeks to engage with contemporary culture through vibrant performances that honor traditional flamenco and their passion for music and dance. Wednesday, Oct. 17, at 7:30 p.m. Recently crowned the “best emerging band in NYC” after their performance at the Battle of the Boroughs, Addi & Jacq have created a diverse body of music. Their songs range from delicate acoustic tunes to layered electric harp grooves. Thursday, Oct. 25, at 7:30 p.m.
Latin Grammy Nominees Flor de Toloache made New York City history as its first and only all-women mariachi group. Founded in 2008, Mariachi Flor de Toloache is lead by singers Mireya I. Ramos and Shae Fiol. Reminiscent of the early days of mariachi the group started as a trio, harp, violin and vihuela. Today, Mariachi Flor De Toloache performs as a full mariachi ensemble. Tuesday, Oct. 30, at 7:30 p.m. The first track on Lo Moon’s self-titled album is ever so gentle in its clarion call. Starting softly with light beats, ’80s synths and the controlled vocals of lead singer Matt Lowell, it eventually erupts in a stadium-ready chorus cry of “This is it! This is it now!” For Lowell and his two main band mates Crisanta Baker and Sam Stewart, Lo Moon is it: the moment they’ve each individually been working towards their entire musical lives. Monday, Nov. 5, at 7:30 p.m.
Tickets will be offered in multiple forms. The Underground Sound Pass will grants patrons tickets to seven shows and seven free drinks for $125. Passes are on sale now at the VPAC box office, by calling 970-845-8497 or visiting http://www.vilarpac.org. Single tickets will go on sale Monday, Aug. 27 and do not include a beverage offering.